Conrad Martens Plumbing has been servicing the Brisbane western suburbs since our establishment in 1982. Closely located to Brisbane west, our office is based in Indooroopilly. This proximity allows our local plumbers to provide a quick and reliable service to our clients throughout the Brisbane western suburbs. A large majority of our long standing customers are located within the western suburbs including Toowong 4066, Indooroopilly 4068, St Lucia 4067, Taringa 4068, Auchenflower 4066, Chapel Hill 4069, Brookfield 4069, Kenmore 4069, Pullenvale 4069 and Jindalee 4074 have been using us for over 40 years. Conrad Martens Plumbing aims to provide the best price, service and advice possible to our customers. Though our affordable pricing, workmanship guarantee and rapid response, we have managed to establish ourselves as Brisbane Western Suburbs’s trusted local plumber of choice. Professional drain cleaning service to rectify all your sewer and stormwater drain problems. Utilising the electric eel, plunger or sanisnake, our drain specialists will provide a comprehensive drain cleaning solution for your property. We clear, repair and replace sewer and storm water lines. Emergency after hours plumbers are available for any urgent after-hours blocked drains in Brisbane’s Western Suburbs. From concealed underground leaks to burst pipes, we can detect and fix all your water leaks. Our licensed plumbers can accurately locate the source of water leaks underground, under driveways and concrete slabs using specialised water leak detection equipment. As a Emergency Brisbane West Side Plumber, we can provide a rapid response to minimise the damage or water wastage. All brand hot water heater repairs, servicing and replacements including Rheem, Dux and Rinnai. Our Hot Water Specialists are fully equipped with valves, thermostats and elements. Through extensive product training, we are licensed and capable of repairing electric, heat pumps, gas and solar water heaters. We offer competitive hot water system installation backed up with a price guarantee. A hot water emergency service is also available for any after-hours problems in Brisbane’s western suburbs. Conrad Martens Plumbing & Hot Water provides speedy service for all kitchen appliance plumbing problems. We can assist with jammed garbage disposals, leaking dishwasher hoses and water filter cartridge replacement. Our Brisbane west side plumbers also regularly install kitchen appliances including; icemaker fridges, dishwashers and garbage disposal units. We have seen a dramatic increase in the development of apartment blocks within Brisbane west throughout our time working within this area. We regularly carry out water audits within these apartments and install various water saving devices when providing a water compliance report for rental properties. It is recommend this is carried out every 2 years or prior to any new tenancy allowing us to have built a strong rapport with many Real Estates and Property Managers who have chosen us to be their local Brisbane west plumber of choice. As well as this, our plumbers have extensive experience in roof, gutter and downpipe repairs. We know how frustrating an undetectable roof leak can be and how much damage this can cause when left untreated. Our friendly team is well acquainted with dealing with roof leaks, installing and replacing downpipes, repairing and replacing guttering, unblocking downpipes, re-sealing joins and flashing, replacing roof tiles and carrying out roof cleans to provide you with a peace of mind during the storm season. Although there are many new establishments within the Brisbane western suburbs there are also several older suburbs that are comprised of established properties that have many of the original houses that were first built displaying distinctive designs from the late 1960’s, early 1970’s. Consequently, blocked drains, burst pipes, taps and toilets are among the common maintenance plumbing issues we attend to here. As well as this, we have a specialised team of gas fitters on board who are able to carry out gas oven/stove repairs and installation and hot water system repairs and replacements. For those after hour plumbing issues throughout Brisbane west, there is always an Emergency Plumber on standby as well as an emergency 24/7 after hours paging service. If you find yourself in a situation where you have a burst hot water system or an overflowing drain at your property our team of reliable local plumbers are always on hand ready to help. 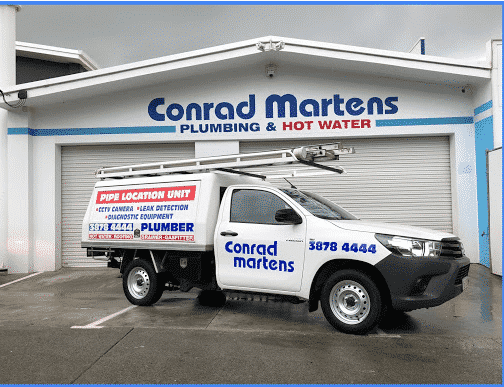 Conrad Martens Plumbing specialise in reliable plumbing services and gas fitting across the Brisbane metropolitan area including the Brisbane western suburbs. We pride ourselves on providing customers with the best price, service and advise available. Our Brisbane plumbers, gas fitters and hot water specialists are highly trained, experienced and ready to provide an emergency response. With over 40 years’ experience, Conrad Martens Plumbing has built up a reputation for delivering quality plumbing services in Brisbane’s metropolitan area, ranging from inner-city Brisbane to greater Brisbane and its surrounding suburbs.